In another great afternoon of boxing at the 2013 AIBA World Boxing Championships in Almaty, Kazakhstan, the Lightweights (60kg) and Light Welterweights (64kg) took to the ring for their first preliminary bouts. 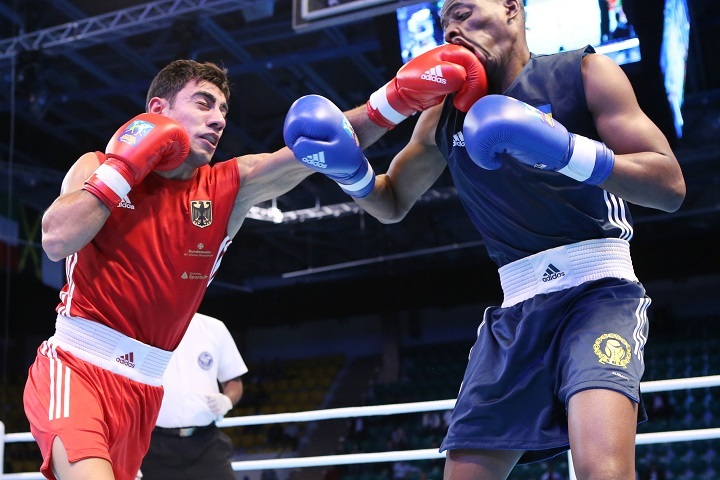 We had some World Series of Boxing (WSB) stars on display along with several Road to Almaty boxers, who put their skills to the test in one of the toughest environments possible. We also kept an eye open for boxers we feel could surprise this year. Germany's Artem Harutyunyan took on Sweden's Clarence Bojang at Light Welterweight in what was comfortably the best bout of the session and possibly the best so far in this Championships. The German, who is rumoured to be joining his brother Robert this year with the WSB German Eagles, looked like he was on a mission from the opening bell. But his Swedish opponent had great foot work and fantastic hand speed which he used to stay out of trouble and pick off the German on the way in. This made for a highly engaging encounter. The Swede looked in serious trouble at one point half way through the first, when the WSB boxer had him pinned to the ropes but through some incredible evasion under pressure he got himself out of trouble. Harutyunyan seemed to have the advantage in the power stakes and he was relentless in pushing forwards. Predominantly a southpaw, Bojang's willingness to switch when necessary made him very mobile in the ring which kept him out of trouble. In the end, Harutyunyan came out with a split decision. Though the Swede will probably lament the tough draw, he could almost certainly have gone further with another opponent. "The first fight is always a difficult one, you need a little while to get into it", said Harutyunyan. "I fought my opponent in the first round of the European Championships as well and he is a tough guy. I have a lot of respect for him. Now I'm going to try to relax and take my mind off boxing and hang out with the team". APB boxer Dmitry Polyanskiy of Russia took on a very game Timothy Locock of Australia at Lightweight. The boxer from down under was brave though and kept coming forward even after getting caught with an incredible left from the Russian southpaw, the impact of which could be heard around the whole arena. The Australian seemed to end up boxing almost square on at times as the Russian cut the angle with ease to cruise to a comfortable sounding 3:0 victory. Although Artem Harutyunyan may well have stolen this category as well had his selection been officially confirmed, but nonetheless an honourable mention is deserved by Azeri southpaw Elvin Isayev. He was totally dominant over Mohammad Amin from Bangladesh at Lightweight. Though the Bangladeshi took to the centre of the ring gamely he was outclassed by the WSB boxer. By the time round three rolled around, the confident Azerbaijani was almost picking his shots at will. Nonetheless the Bangladeshi was clearly here to compete and deserves credit for hanging in there. It was not enough to prevent a completely overwhelming victory: (3:0) for the Isayev however. Elsewhere Scotland's Josh Taylor who fought for the British Lionhearts in Season III looked in great shape at Light Welterweight against Akiel Outram of Trinidad and Tobago. The southpaw landed an absolute bomb of a right hook with his opponent against the ropes at the very end of round one and subsequently looked very comfortable indeed during the bout. He was able to land his entire repertoire and by the third he was stalking his opponent (who was very much in survival mode) round the ring. Taylor didn't seem to lose any speed in his hands or feet as the bout went on and looks to be in very condition indeed. "I thought I boxed alright", said the Scot in understated fashion. "The last round and a half I was happy just to stand there because there wasn't much coming back at me. I think I could have done a little bit more but I potentially have another three or four fights so I'm happy with what I've done". Alexandros Tsanikidis of Greece was very unfortunate not to be going through to the next round against Raymond Moylette of Ireland at Light Welterweight. The Greek boxer caught the Irishman with a hard shot that left him staggering just a few seconds into the bout. He recovered however to box to in an incredibly close fight that was almost too hard to call. Unfortunately for Tsanikidis, the decision went against him. Sean McComb of Ireland looks like a boxer to watch this year. He dropped his opponent Almog Briga of Israel in just twenty seconds into his opening round. The Israeli got up and returned fire extremely well, however scoring with heavy looking overhand lefts. The Irish boxer began to work out how to avoid these and scored a second knockdown with an uppercut in the third with just one second left on the clock to take the victory. "He hit very hard over the top, but in between rounds, my coach said to start circling more rather than just stepping back and that's when I started avoiding them. I was a lot more comfortable then". Kenneth Egan, the celebrated Irish boxer who took a silver medal in the Beijing 2008 Olympic Games has come to the World Championships, but for the first time in ten years he is not here as an athlete. Rather he is now working as a boxing journalist for RTÉ and the Irish Sports Council.